N is for Novice Series. Although I also thought these were called the N series because the first one was written by Douglas Niles. 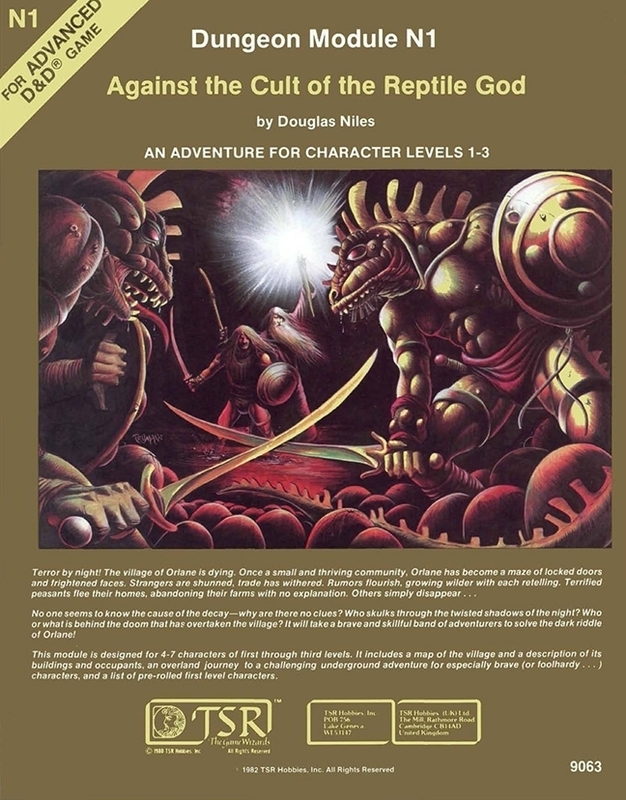 The idea behind the N series was to provide yet another set of adventures for starting players. It makes sense really. You will have far more low-level characters than high-level ones. Of these, it is N1 that interests me the most. It is ranked as 19 of the top 30 greatest adventures of all time and Douglas Niles was an author I have grown to respect over the years; especially for his contributions to AD&D. Plus for me this module was published in that "Golden Age" of adventure design in 1982 when so much great stuff was going on. Just so much good stuff out there. Of the N series, N1 is the best known to me. I have read through it many times and always wanted to do something with it. I started playing N3 once, back in my college days, but I don't think we got very far. N4 Treasure Hunt is an interesting one since it is the only AD&D adventure I know of that has the characters start at 0-level. Very interesting choice if you ask me and maybe something I should try for my "Second Campaign". For people reading this and have no experience in gaming, these are all great places to start. Well except for N2 and nobody likes that adventure! I think N5 was the first module I owned. Never ran it (never really ran any module), but it was nice to have. N4 looks very interesting indeed. 0-level AD&D is worth checking out. I actually LOVED The Forest Oracle, though I lost it years ago. Maybe I'd look at it through different eyes today. That's great you are up to date with your A-Z posts, congrats! Great topic for A-to-Z. As someone who has never played D&D, but has always been interested and fascinated by it, this is very interesting!